The momentum of October 2018 home sales remained stable compared to last year’s levels, up + 0.1 % compared to October a year ago. Home sales this month were 2,070 compared to 2,068 in October 2017. 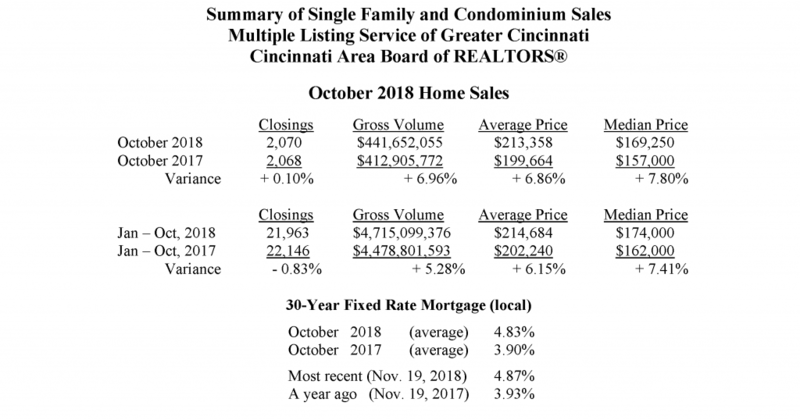 “2018 home sales still remain one of the top three strongest in over 10 years,” said Phil Morrical III, President of the Cincinnati Area Board of REALTORS®. “Even though the winter months are coming near, this is still a great time to list and sell your property. Interest rates remain low and there are plenty of buyers,” said Morrical. The October average home price climbed to $213,358 compared to $199,664 a year earlier, a + 6.86 % increase. At the same time, the inventory of homes for sale, as of October 31, continued its year-over-year declining trend, but at a much slower rate, from 5,491 a year ago to 5,409 in October 2018, down – 1.49 %. “Greater Cincinnati is a very affordable market for home buyers and the inventory is turning over quickly,” said Morrical. “For October, the “Months’ Supply” (Absorption Rate) is 2.6 months’ supply. This means that taking October sales and comparing it to the October active inventory, we will see how many months of possible sales exist before there is zero inventory. 5.0 is considered a “stable market.” Below 5.0 months, is a Seller’s market; above 5.0, is a Buyers’ Market,” said Morrical. Local home mortgage rates in October averaged 4.83% for a 30-year fixed rate loan. The rates were up compared to 3.90% a year ago. At these fixed rates, the monthly principal and interest payment on a $100,000 home loan with no money down would be approximately $526. Nationwide, October home sales were up +1.4% compared to September on a seasonally adjusted basis and were down – 5.1% from October 2017.